We found this wool to be very soft and it has a great crimp. 2017 was our first shearing season and we learned allot from it. We hired a wonderful shearer for our first fleeces, but learned a valuable lesson in the process. Our shearer made the sheep look show-ready, but unfortunately the result was lesser quality fleece. Because of the shearing process in 2017, we ended up with a lot of second cuts in this season’s wool and the staple length was rather short, due to the way it was sheared. No fault of the shearer, we just didn’t know what we were expecting (or needing for that matter). We also learned that washing the wool ourselves, by hand, was incredibly labor intensive and left the wool somewhat felted. 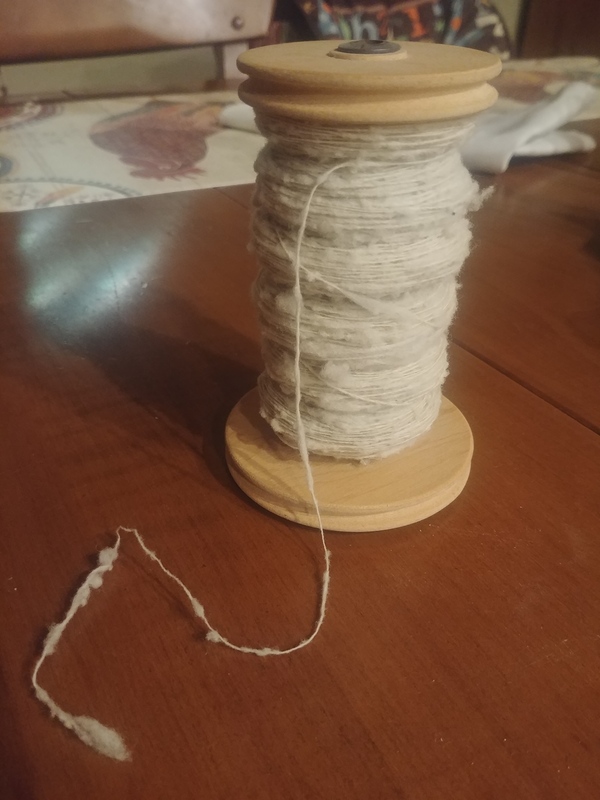 In order to put this wool to use we had to open the fibers up again before putting them through the carder, or use a hand carder. We believe a tool called a picker would be helpful in opening up the fibers to make them easier to card. After having manually opened some of the locks (and wads) of felted fiber we were able to card about 5 “rollogs” weighing about 1oz each. This spins into a very bumpy yarn wit h a lot of “slubs” or lint. It has a very “artsy” texture that would make great place mats or other items where a lot of texture is desirable. It is nonetheless very exciting to actually spin wool from our very own sheep. We have set the price for this wool at only $12 per lb because of the inferior shearing method, and overhandling during the washing phase. It is still a very spin-able wool for a somewhat seasoned spinner and makes a great yarn for certain applications.